Is this why they want us to take part in elections? 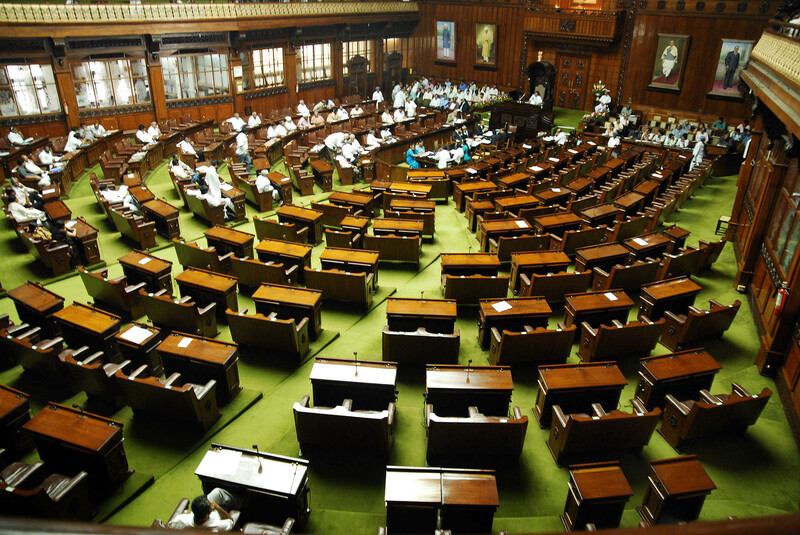 Row after row of empty seats in the Karnataka legislative assembly in Bangalore on Friday, as the Congress and JDS boycott proceedings in protest against the speaker disallowing a debate on the situation arising out of the Supreme Court’s observations while quashing his order disqualifying 16 MLAs. A PTI report says the Congress legislature party has failed to arrive at a decision on whether to boycott the entire session, but a television report says a full boycott is on. This entry was posted in Issues and Ideas, Kannada & Karnataka, Mysore-Bangalore and tagged Churumuri, CLP, Karnataka Photo News, KPN, PTI, Sans Serif, Supreme Court of India, Vidhana Soudha. Bookmark the permalink. ← Do Tamilians have more asmita than Kannadigas? Even if it is housefull, what difference does it make?. They will only be shouting at each other and fighting with each other. Most of them will be sleeping. Instead, this scenario is much better – Calm, tranquil, serene, peaceful……. and get the work done. Yes, what do these guys do anyway besides indulging in some self-interest for their relatives and caste members?